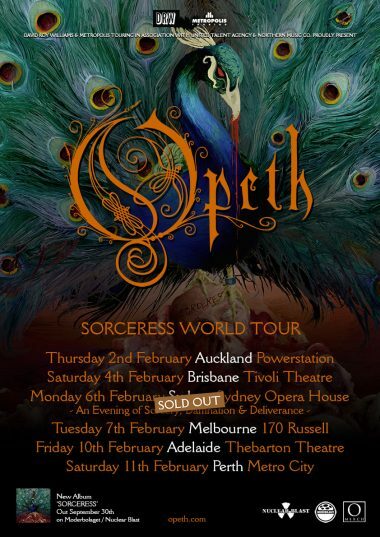 It has been 11 years and 3 studio releases since Opeth last played a show in New Zealand. And from the excitement outside Auckland’s Powerstation, we can definitely assume that they are long overdue. 19:00 The line outside stretched well over 100 meters as we came waltzing up to the gig, prompting a quick detour to Galbraith’s pub across the road for a pint. Once inside we were hit by a strong wave of B.O courtesy of the black t-shirt brigade. High spirits and freshly poured beer in hand helped to focus our remaining senses. We did, however, move outside just in case, meeting up with many well socially lubricated excited fans with tales of sold out shows and the hunt for extra tickets. 20:00 Doors open and the black sea crashes through the gates. Once inside, the merch booth is already pumping out t-shirts. Its only competition is the beer flowing from glass bottles and into plastic cups. One gladly partakes. Having seen them just one day prior at Wellington’s Valhalla, I was keen to see what Brisbane Prog-rockers Caligula’s Horse could bring to a larger venue. Playing with a true sense of passion executed with precision, their Brisbane sound translates well to a house packed with Kiwi metal heads. Soaring vocals and blazing yet nuanced dueling guitars showed Caligula’s Horse’s professionalism and judging from the crowd’s reaction they will most certainly be welcomed back to our shores. Too much of the creature made us lose track of time but the short break after Caligula’s Horse four song set sent us one more time back to the bar rubbing shoulders with the ever-increasing sea of people. I managed to secure a great spot right next to the sound desk ensuring that I would make the most of the acoustics of the venue. And it provided easy access to the bar. Standing in the crowd empty-handed just did not feel right. Opeth walked onto the darkened stage greeted by the deafening cheer of the crowd. Crimson and silver lights flashed. Little dampened the sound of the audience as Opeth ripped into the title track off their latest release, “Sorceress”. The well-rehearsed set is filled with a mix of old and new continuing with “Ghost of Perdition” – a personal favourite of mine – before moving on with “The Wild Flowers” (also from their latest release). Not a band famous for an overly energetic performance, the set is highlighted with Mikael’s dry humour, often followed by sensible chuckles from the rest of the band and audience alike. A well-balanced sound is at points dressed up with some silky smooth lead guitar tones (Frederik is unmatched for the night). Frederik is ripping it up! The one low point of the night came when it was time for Mikael to announce their last song for the evening. A large portion of the crowd started to boo but was quickly turned into a cheer when they were told that it was bad form. The set ended as it quite often does with a perfectly performed rendition of the song “Deliverance” from the album of the same name. All in all a fantastic night was had by all. Our night ended on Auckland’s Queen Street, where we were treated to a show by a 17-year-old male who was taking a joy ride in a forklift that he had stolen. We filmed this young man and sent a video through to stuff which can be viewed here.